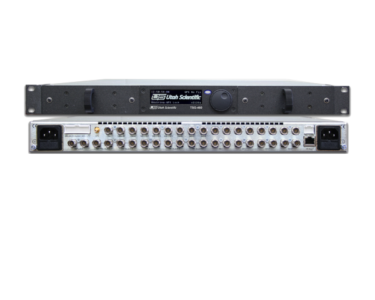 Utah Scientific’s Sync Generators are designed to satisfy all needs of digital (standard, high definition & 3G) and mixed digital/analog operational environments in broadcast, post-production, OB and other applications. They provide all the reference (Color Black, Tri-Level Sync), timing and test signals (including LTC and VITC), together with analog audio, AES audio & Word clock, needed to satisfy any application in PAL, NTSC, SD-SDI, HD-SDI, 3G-SDI, and mixed-standard installations. The TSG-460 is the ultimate sync, test pattern & time reference generator designed to satisfy all needs of digital (standard, high definition & 3G) and mixed digital/analog operational environments in broadcast, post-production, OB and other applications. It provides all the reference (Color Black, Tri-Level Sync), timing and test signals (including LTC and VITC), together with analog audio, AES audio & Word clock, needed to satisfy any application in PAL, NTSC, SD-SDI, HD-SDI, 3G-SDI, and mixed-standard installations. The CO-465 is a modular automatic SPG changeover unit intended for use with the TSG-460 SPG / Test Pattern Generator. It can be configured as 6 or 12 measured channels in a 1U rack-mount chassis. All channels measure both the “primary” and “backup” signals. The standard unit is supplied with two “hot swappable” redundant power supplies for maximum security. The power supplies are directly accessible from the front panel.